Home » Treatments » Who Are The Real Experts In Treating Tennis Elbow? I think it's an important question to ask: Who are the real authorities when it comes to the treatment of Tennis Elbow?... Doctors? Surgeons? Physical Therapists? Chiropractors? Athletic trainers? As a little “thought experiment” let's take a look at what constitutes an expert or authority, in general. So, who is more of an expert in your mind? Someone who has academic, technical or theoretical knowledge – but who doesn't have any practical experience with it? Or someone who has significant practical experience with something – but who doesn't necessarily have any official academic training in the subject? The reason I pose the question this way to you, (not offering any middle ground) is that this is how the landscape of treatment for Golfer's and Tennis Elbow often appears to me. Now, I don't want to disparage over-worked and well-meaning Doctors, but do you imagine that your average general medical practitioner is an expert in treating Tennis Elbow? Here's the problem with this approach to treatment. First off, these things are not really treatments for the underlying cause of tendon pain and injury. And to mitigate or suppress a suspected symptom of the injury – That being inflammation. And suppressing a symptom is not the same as treating the injury that causes that symptom – Is it? The medical research going back decades has demonstrated pretty clearly that Tennis and Golfer's Elbow (and many other chronic tendon problems) are not primarily inflammatory conditions. Inflammation has never been the problem, it's always a symptom – AND the research says inflammation isn't even present in these conditions, usually! 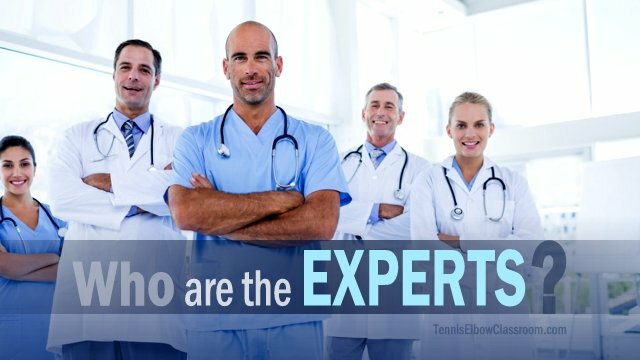 So, what I'm really saying here is that we have these medical authorities – these ostensible experts – who are offering a treatment based on a theory about Tennis Elbow that others in their own field, medical researchers, say is wrong, and which has been wrong for 30 plus years. But the medical system, being what it is, has not updated itself and the understanding that Tennis and Golfer’s Elbow are degenerative conditions where inflammation is largely missing – not raging out of control – hasn't trickled down from the academic medical researchers in the ivory towers to the Doctors on the ground floor handing out the inflammation pills and the Cortisone shots. Again, not to disparage Doctors. Think of all the B.S. they have to put up with these days in managed care, and all the more serious conditions they have to stay up to date on, not to mention all the medications and their potential side effects and interactions. Golfer's and Tennis Elbow are pretty low on the scale of priorities, after all, so how could we even begin to blame them if they're not all experts on Tennis Elbow. Golfer's and Tennis Elbow are soft tissue issues – meaning they are muscle and tendon problems – and there's no debate about that. Aren't the practitioners who treat and manipulate tissues by hand the experts on the front line in the treatment of Tennis and Golfer's Elbow? Not the practitioners who treat the symptoms from afar? These are muscle and tendon problems, by nature, after all. Who knows best how to work on these tissues? To massage and manipulate them to help restore plasticity, blood flow and normal tone and function? Massage Therapists And Other Bodyworkers Are The Experts In Manipulating Muscles And Tendons To Help Them Heal! If Tennis Elbow is a condition where muscles and tendons have become dysfunctional or abnormal (which it is) who better to treat it (or teach you how to treat it yourself) than someone who manipulates tendons by hand? But I've been specializing in treating chronic tendon problems, especially Tennis and Golfer's Elbow for about a decade and a half now, and I've had a very high success rate with my techniques, which are technically a form of “Massage” but much more specific than most forms of Massage Therapy. See this article and video for an overview of the top three massage techniques I teach and use. And I've been successful in teaching thousands of people how to treat their own Golfer's and Tennis Elbow online through my self-help programs over the past 10 years. Or should I say “they've been successful in treating themselves?” since they're doing all the work! Please check out my programs for Tennis and Golfer's Elbow and when you join I'll teach you those techniques, too!